“Cross for the Unforgiven: 10th Anniversary Multiple,” 1 of 2, by Mel Chin, 2012. AK47 assault rifles cut and welded. Courtesy of the artist. Curated by Susanne Slavick, Andrew W. Mellon Professor of Art at Carnegie Mellon University, the exhibition opens Tuesday, Aug. 25, and runs through Saturday, Oct. 24, at the museum’s galleries in Altgeld Hall. A public reception is planned from 4:30 to 6 p.m. Thursday, Sept. 10. Slavick will deliver a public Curator and Artist’s Talk at 7:15 p.m. Thursday, Oct. 1, in Altgeld Hall 125. She will discuss the exhibition and her personal art practice. A small reception begins at 6 p.m. that day in the museum. This exhibition is part of the Art Museum’s fall series examining contemporary artists’ exploration of relevant social issues in today’s world. “Unloaded” examines the historical and social issues surrounding the availability, use and impact of guns in our lives from a number of perspectives, though none endorse them as a means to an end. These contemporary artists shed light on a divisive topic: taking part in the national debate on gun rights deploying art as a device to continue a critical dialog around the challenging issues surrounding firearms in America today. 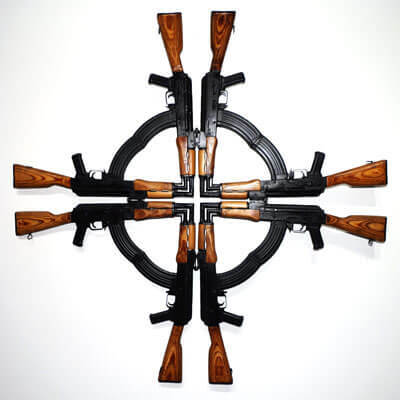 These works “examine and represent the role that guns play in our national mythologies, suicide rates, incidence of individual and mass murder, cases of domestic violence and the militarization of civilian life. Gun ownership and control is a divisive topic in this country,” Slavick said. “You will have to sing. 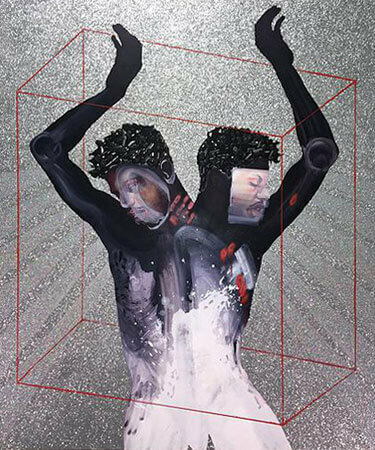 Paper won’t hold the wound I leave.” by Devan Shimoyama, 2015. Oil, glitter and colored pencil on canvas. The exhibition features multi-media work by 20 contemporary artists including Slavick, Lauren F. Adams, Nina Berman, Joshua Bienko, Casey Li Brander, Anthony Cervino, Mel Chin, Cathy Colman, DADPRANKS (Lauren Goshinski, Kate Hansen, Isla Hansen, Elina Malkin, Nina Sarnelle and Laura A. Warman), James Duesing, Jessica Fenlon, Vanessa German, Jinshan, Andrew Ellis Johnson, Jennifer Nagle Myers, Adrian Piper, Don Porcella, Devan Shimoyama, Renee Stout and Stephanie Syjuco. Picasso’s “Guernica” as a Weapon of War, 1937-2003. Barbara Jaffee, associate professor, Division of Art History at NIU, examines the complicated history of Picasso’s “Guernica,” which the artist himself described as a weapon of war. This lecture explores the grandiose and apocalyptic canvas from its political creation for the 1937 Paris International Exhibition and its subsequent depoliticizing during display in New York’s Museum of Modern Art New York as an icon of arts-for-art’s sake. Most recently, artist Joshua Bienko’s latest appropriation of imagery from Picasso’s “Guernica” can be seen in the “Unloaded” exhibition. Altgeld Hall 315, 5 to 6 p.m. The Right to Keep and Bear Arms in America: Stronger than Ever: A public lecture presented by Artemus Ward, assistant professor, Department of Political Science at NIU, examining the changes – both political and legal – in recent gun rights lobbyists’ action and Supreme Court decisions that have led to stronger present-day gun rights than ever before in American history. Altgeld Hall 315, 5 to 6 p.m. Guns and Consequences: Voices of Poets Addressing Gun Violence in Their Neighborhoods: Performances and readings by NIU students and by nationally known, award-winning, Chicago-based poets and spoken word artists. Co-sponsored by the Center for Black Studies and the Student Diversity and Equality Committee at NIU. Altgeld Hall 315, 7:30 to 9 p.m.
“Massacre of the Innocents,” by Andrew Ellis Johnson, 2015. HD video, detail from film still. Courtesy of the artist. Gun Culture, Politics and Identity in American Society. Kirk Miller, chair and associate professor in the NIU Department of Sociology, describes contemporary American gun culture while highlighting the links to group and individual identity implicated in the politics of guns, security, race, class and gender. 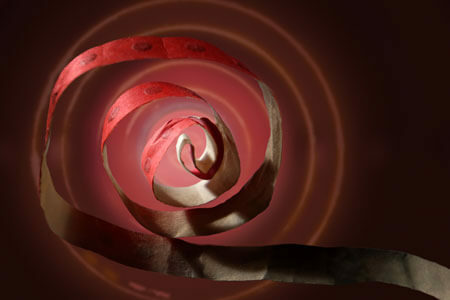 Altgeld Hall 315, 5 to 6 p.m.
Artist’s Slide Talk: Jessica Fenlon, Altgeld Hall 315, 5 to 6 p.m. Taking Things Apart: Hands-on artist workshop on deconstructing difficult topics, led by Fenlon. Visual Arts Buidling 213, 9:30 a.m. to 12:30 p.m. Limit: 12 participants; observers welcome. Pre-Registration required. Send and Receive: A participatory listening project performed by Fenlon that provides a space for viewers to reflect and share with the artist their own personal lived experiences with guns and violence that might resonate or share a connection with the images in Unloaded. NIU Art Museum, noon to 4 p.m.